For some of us, smartphones have become one of the greatest threats to our productivity. For others, they are the greatest productivity tool ever invented. 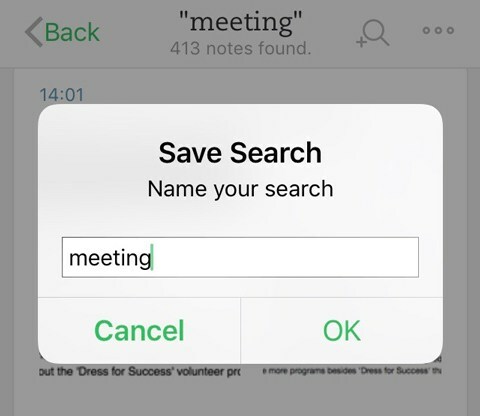 With Evernote, you can unleash the power of your handheld computer to optimize your productivity. Evernote widgets and quick note options were designed for taking notes at the speed of thought (ok, not quite that fast, but still pretty fast). 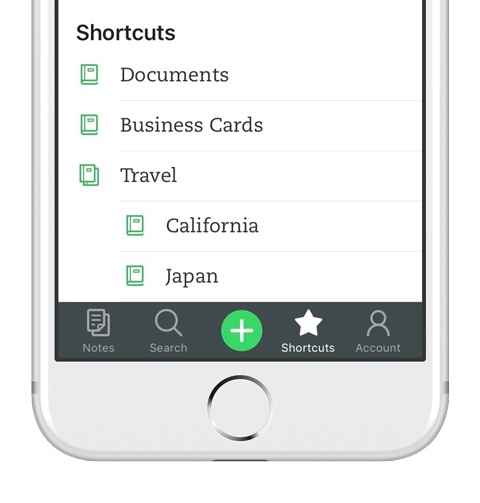 With Evernote widgets, you can quickly jot down text notes, snap photos, and create reminders, all without opening the Evernote app. You can even set up the widget to display recently-viewed notes on the lock screen. 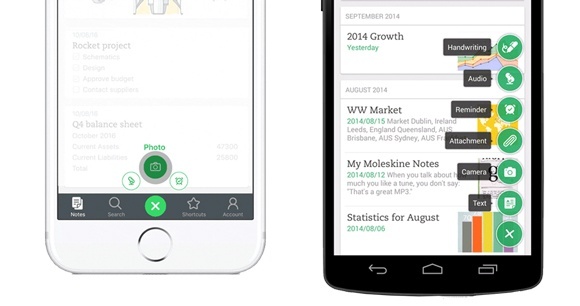 Evernote widget options vary slightly on Android and iPhones. If you already have Evernote open, long press the ‘new note’ button (‘+’) to view options similar to those found on the widget: record audio, snap a photo, or set up a reminder. iPhone 6s/6s Plus/7s/7s Plus, running iOS 10, come with the 3D Touch feature that lets you deep press Evernote from any Home screen to bring up all of the quick note options even faster. On Android, quick note options also include handwritten notes and file attachments. Many of you know how easy it is to save emails to Evernote. But, wait, there’s more—you can forward emails to a specific notebook so email content can live where any of your related project files, meeting notes, and online research already live. To save an email from your phone, simply open the email, forward it to your unique email address, and prepend the name of any personal notebook (like this: “@My Notebook”) in the ‘Subject’ line. 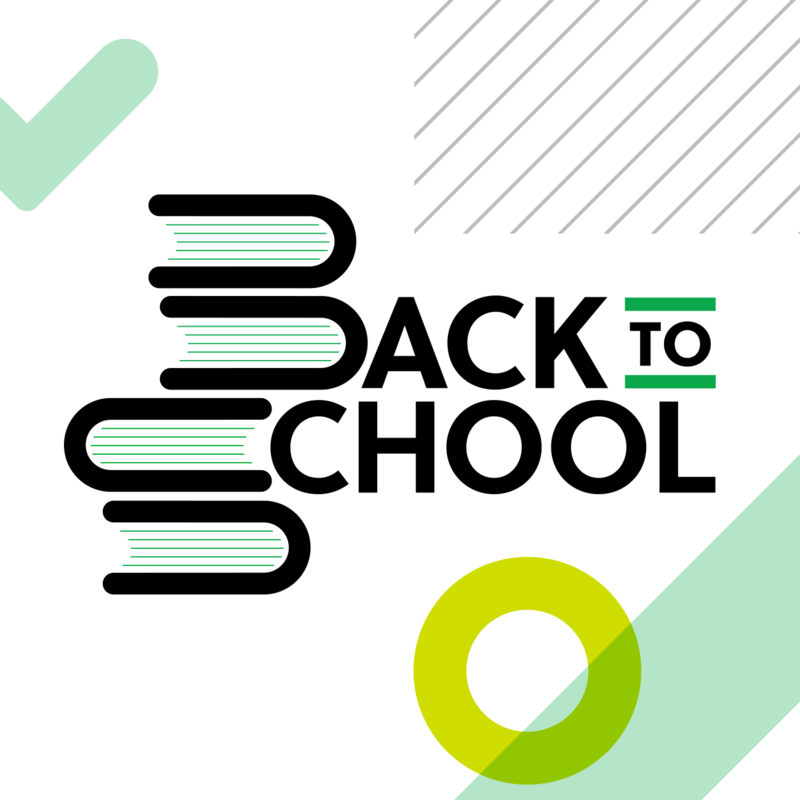 The contents of your email will automatically be saved as new note in the specified notebook, without needing to open Evernote. 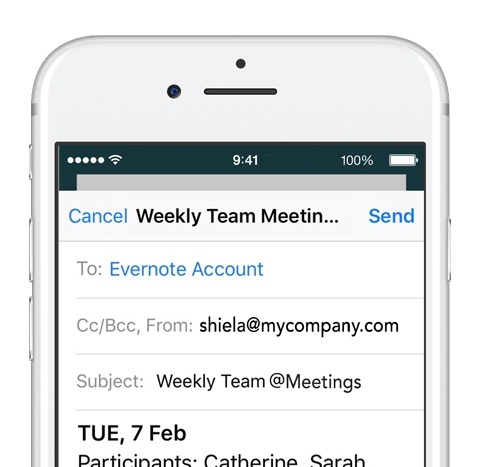 Microsoft Outlook users can also use the Evernote add-in to clip Outlook emails directly into an Evernote notebook. This add-in, which has already been available on Mac and Windows for some time, is now on the Outlook mobile app for iOS. Forward all emails sent from “Google Analytics” with the phrase “weekly report” in the subject line to your “Sales Reports” notebook. Star any message in Gmail sent by a vendor to save its contents and the attached invoice as a new note in your ‘Vendor Invoices’ notebook. TIP: Set up email forwarding filters and automations on your desktop computer. Then, use your phone to trigger auto-forwarding by adding labels, stars, or updating subject lines. Why waste time sending frequent reminders to your project team to review meeting agendas week after week? Share a URL link to a shared note or a shared notebook instead. Anyone you’ve shared the link with can view the contents of a shared note or notebook, even if they don’t use Evernote. Note: Individual business notes can be shared as URL links. In order to minimize the sharing of company information, business notebooks, however, cannot be shared as a URL link. When sharing project notebooks with others who use Evernote, you can set up note reminders to notify others whenever you add or update notes. 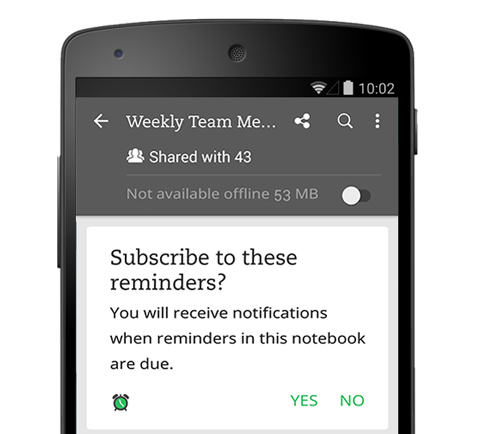 Individuals who’ve joined your shared notebook can subscribe to email reminders and be notified of your changes. 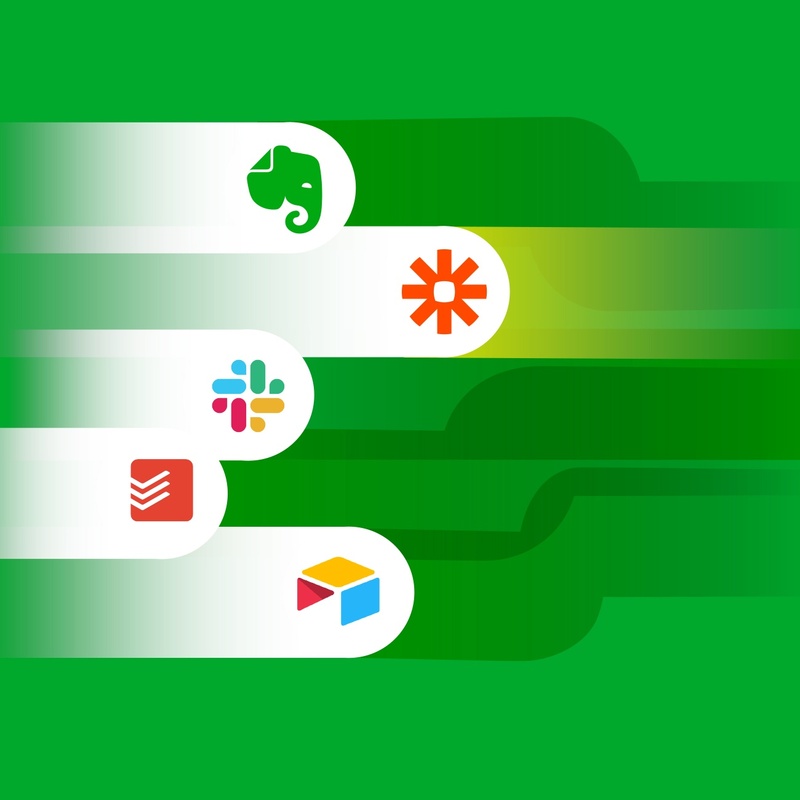 Evernote search filters, saved searches, and shortcuts are three secret weapons that can help you quickly find what you need, when you need it. Search filters let you exclude any notes you know aren’t relevant to your search. Save time by simply narrowing down your search results. 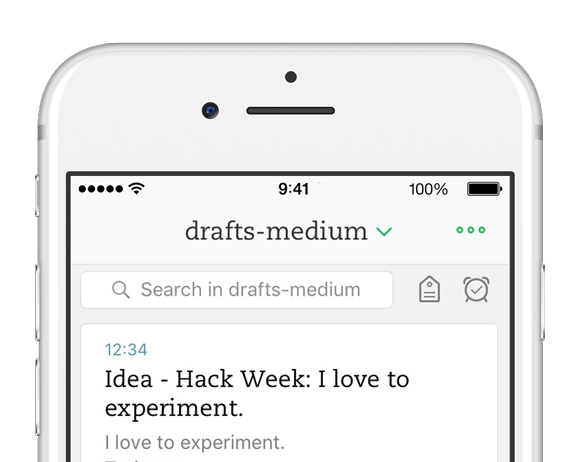 iPhone – Evernote’s latest redesign of the iOS app comes with premade note tag and reminder filters. Tap the alarm clock button at the top of your note list to bring up a list of all the notes with reminders. Tap the tag button to bring up all the notes labeled with select tags. Android – Tap the ‘Search’ button (magnifying glass) at the top of any note list, enter search terms, tap ‘Refine Your Search’, then select a search filter, such as ‘To-Do’s’ (to bring up any notes with checklists). Tap ‘Apply filters’ to see your search results. 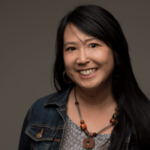 PRO TIP: Want to geek out on advanced searches and take search filters to another level? Saved searches make it easier for you to execute searches you frequently use. Once you’ve saved a set of search parameters (such as keywords and filters) as a ‘saved search’, you can select it at anytime to re-run it. If there are notes, notebooks, or tags you frequently refer to, save them as shortcuts to save yourself a few extra taps. The ‘Shortcuts’ button is found in the navigation menu (Android) or on the tab bar (iPhone). 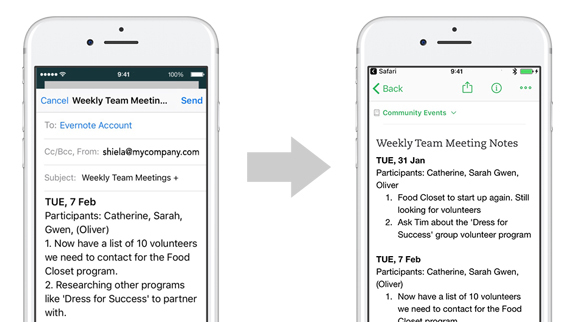 Evernote note reminders notify you to take some sort of action on a specific note. Once you’ve set up an alarm for your reminder, you’ll receive a notification email at the specified date and time. Afraid you’ll miss the email notification? 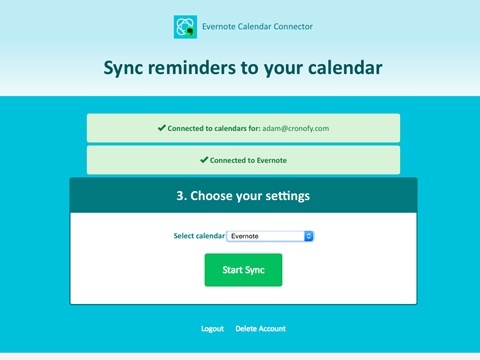 Use the Cronofy calendar connector to automatically convert all your reminders into events on your calendar. 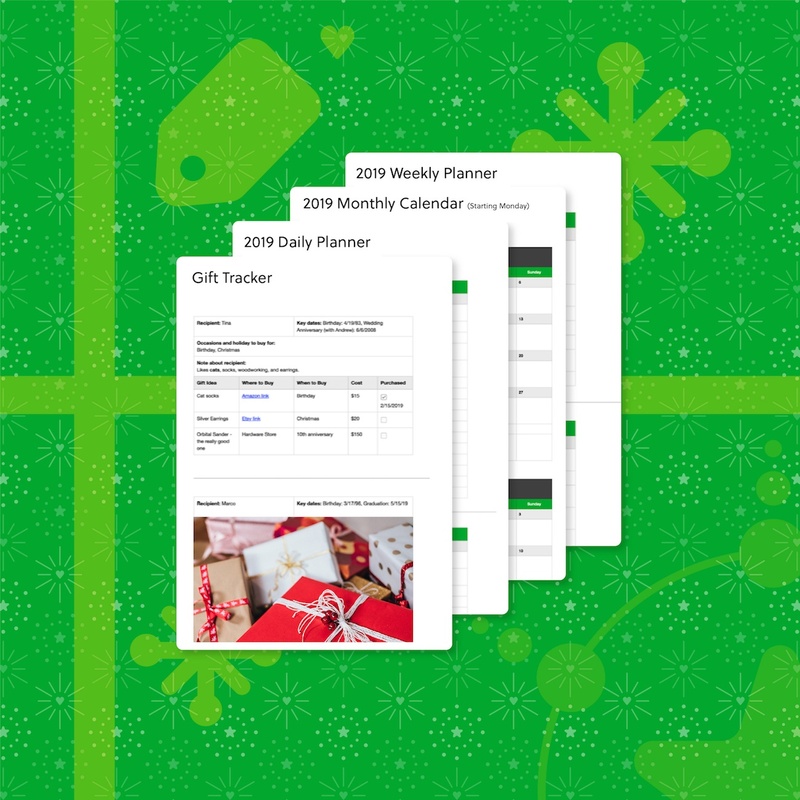 With Cronofy connected to a calendar that syncs with your phone, you can reschedule, rename, and clear reminder notifications from your calendar, without ever needing to launch Evernote. 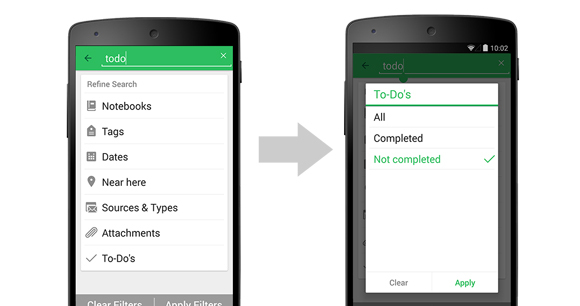 Still prefer having a simple, task management app on your phone? 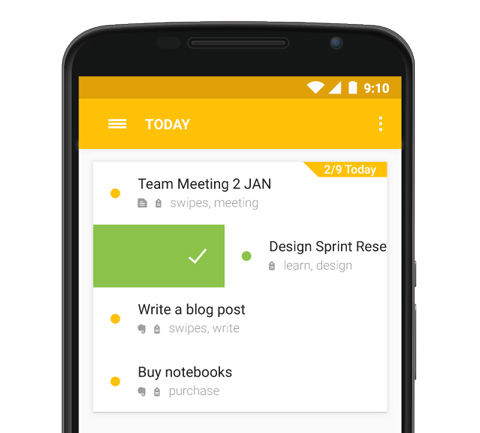 Try Swipes, a to-do list app that was designed to work with Evernote on both Android and iPhones. Swipes is aptly named for the simple, swiping gestures that make it easy to manage your checklists. Task completed? Select the task and simply swipe right to check it off. Need more time? Swipe left to select a time to postpone the task for later. Modern life is increasingly dependent on how well we optimize our time and our resources. 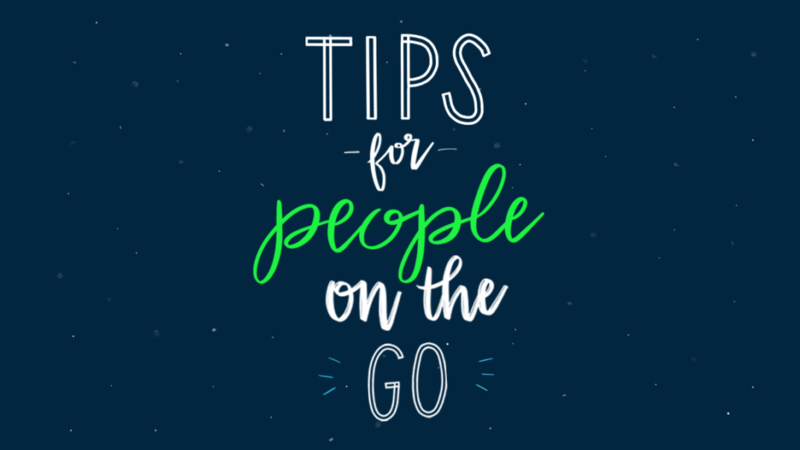 If smartphones have become, in a sense, our remote office, then Evernote is a virtual desktop where we can stay focused, and get things done, no matter where we are.